April 2019 Baiju Shah, chief strategy officer for Accenture Interactive and global lead at Fjord, gave the talk “Design and Strategy: What’s Next?” as part of the Segal Design Leadership Series on April 17. March 2019 Students from Northwestern Law and Segal Design Institute’s EDI program teamed up recently for Design + Law, an event that focused on design thinking as a problem-solving approach for legal service delivery. March 2019 Master of Science in Engineering Design Innovation (EDI) students worked with the City of Chicago to explore new ways for residents to engage with city services. February 2019 In 2015, EDI students collaborated with the consumer products company to design a direct-to-consumer service called Tide Spin. Procter & Gamble announced it will roll out a version of the service to 2,000 locations by next year. February 2019 Twelve EDI students traveled to Boston for the annual Integrated Design Innovation (IDI) Challenge to connect with master's students from peer programs and present work to Feeding America. January 2019 Multimedia art projects created in the fall 2018 ‘Data as Art’ class will be on display in the Ford Motor Company Engineering Design Center until late February. 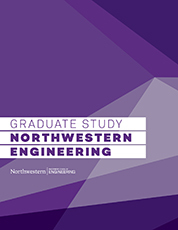 December 2018 Northwestern University’s McCormick School of Engineering and Applied Science celebrated the graduation of its accomplished master’s students from the Engineering Design Innovation program on Saturday, December 15. December 2018 On December 14, eighteen EDI students presented their thesis projects before faculty, mentors, family, friends, and classmates at the Ford Motor Company Engineering Design Center. December 2018 The two-day event featured student work from Segal Design Institute courses and programs, including the MS in Engineering Design Innovation program, Segal Design Certificate, and first-year course Design Thinking and Communication. December 2018 Each graduating student from the EDI program completed a thesis project with support from faculty and industry mentors. The projects spanned multiple fields of design including product, interaction, service, strategy, and user experience. November 2018 Students in the EDI program benefit from intimate conversations with alumni about how design integrates in different fields. That's important in an industry where integrated design innovation skills don’t fall easily into one job category. October 2018 Twenty students in the winter 2018 Service Design course worked with Feeding America to create solutions to distribute rescued foods from retail stores to food insecure community members. October 2018 The EDI program welcomed 19 new students from 5 countries and 15 different schools to campus for Design Boot Camp, a pre-term session. September 2018 This past summer, EDI students interned at Feeding America, U.S. Department of Health and Human Services, Microsoft, and Procter & Gamble Ventures among others. Four students share their experiences. August 2018 EDI students developed conceptual ecosystems for the consumer robot company iRobot as part of their course DSGN 455: Design Strategy. June 2018 During a pilot course, 11 EDI students gained a hands-on experience with Uber Freight's efforts to transform one of the nation’s most critical industries. June 2018 Julia Savich, EDI '17, and Northwestern students with Design For America Summer Studio work to take the stress out of air travel for wheelchair users. May 2018 Gar Waterman, EDI ‘18, balances his courses in human-centered design with work on a student-led startup called PedalCell. May 2018 Phoebe Evans, EDI '17, is a Breakthrough Technology Process Engineer for Mars Wrigley Confectionery. In her spare time, Evans has developed her EDI thesis project, Gumdrop, into a market-ready product. March 2018 In a Service Design course, 20 EDI students developed new ways for Feeding America to get food into the hands of those who need it most. February 2018 EDI students help solve human-centered design issues for undergraduate entrepreneurs working on startup companies. February 2018 On January 27, seventy-seven students from Northwestern, Illinois Institute of Technology, Purdue University, and the University of Illinois at Chicago gathered on Northwestern’s Evanston campus to kick off the White Space Design Challenge. January 2018 Each graduating student from the EDI program completed a thesis project with support from faculty and industry mentors. The projects spanned multiple fields of design including product, interaction, service, strategy, and user experience. December 2017 On December 8 at the Ford Engineering Design Center, graduate students displayed their projects at the 2017 EDI Thesis Show, the culmination of the students' 18-month academic journey. December 2017 The two-day event featured student work from several Segal Design Institute courses and programs, including the MS EDI program, student group Design for America, and first-year course Design Thinking and Communication. November 2017 Graduate students from Northwestern, University of Pennsylvania, MIT, and Carnegie Mellon presented prototypes intended to help those with disabilities navigate urban areas. October 2017 EDI's Studio Director, Amy O’Keefe, works toward making design degrees more consistent among peer institutions. October 2017 The EDI program has announced Jim Wicks as the new Director of the EDI program. Before joining the faculty at Segal Design Institute in 2016, Wicks was the Senior Vice President of Consumer Experience Design at Motorola. September 2017 The newest students in the MS EDI program completed a ten-day bootcamp in design, mechatronics, fabrication before the official start of their program. June 2017 Students enrolled in the MS EDI program participate in summer internships at a variety companies, including Autodesk, IDEO, Medtronic, and Procter & Gamble. April 2017 Students in the EDI program collaborated with Dr. Ruchi Gupta, a Northwestern-based food allergy researcher, to address the vulnerability of students with life-threatening food allergies on college campuses. December 2016 The thesis projects spanned multiple fields of design including product, interaction, service, strategy, and user experience. December 2016 Segal Design Institute celebrated the newest graduates from the MS EDI program. November 2016 Nearly 80 graduate students from four Integrated Design Innovation programs – Northwestern, University of Pennsylvania, MIT and Carnegie Mellon – were tasked to inject innovative design into medicine. November 2016 Engineering Design Innovation students targeted food allergy risks on college campuses with Dr. Ruchi Gupta from Northwestern University Feinberg School of Medicine. October 2016 Chicago Ideas Week inspired city residents to think, dream and connect. EDI students were among the crowd, thanks to support provided by the Norman Fund. March 2016 EDI alumnus and SAP Experience Designer Matt Glibbery helped design Super Bowl 50's Super Bowl City. Read this Q&A to learn more about his experience working on the project. December 2015 Northwestern Engineering researchers break through the touchscreen technology, putting tactile information at users' fingertips. Literally. November 2015 Students from Northwestern and the University of Pennsylvania participated in the third annual 24-hour Design Challenge. This year's focus was emergency epinephrine access. August 2015 EDI student Torey Kocsik was recently interviewed by James Dyson Foundation about how she came to be an engineer as well as some of the challenges of being a female in a male-dominated industry. EDI profiles reveal why students chose the program, what inspires them, and more.